See the Resusci Anne QCPR - Full Body at First Aid Store™ - now improved for multiple feedback options that provide opportunity to focus on student competency. Resusci Anne QCPR sets a new standard for high quality CPR training. 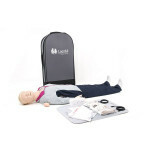 The Resusci Anne QCPR is an adult CPR training manikin now improved for multiple feedback options that provide opportunity to focus on student competency. Measurement, assessment and quality feedback are key factors in developing competency. 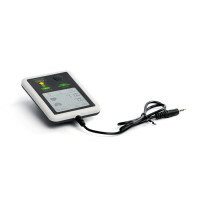 Offers mobility, simplicity and flexibility to help increase the quality of CPR. 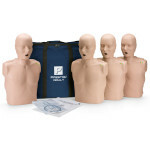 Advanced feedback per individual Resusci Anne QCPR manikin or managing 1 – 6 Resusci Anne QCPR manikins. Availabe for Microsoft Windows only. Laptop not included. Realistic anatomy including head tilt, chin lift, compression depth, compression force and chest rise. Ventilation system provides appropriate chest rise with BMV (Bag Valve Mask) and MTM (Mouth to Mouth). Enhanced measurement and feedback capabilities. Includes: Full Body Manikin, 3 Decorated Resusci Manikin Faces, 2 Disposable Airways, 2 Extra Compression Springs (Hard and Soft), Kneel mat, Jacket, Pants, 50 Resusci Manikin Wipes, USB cable (for use with any USB power supply), User Guide, Important Product Information. Note: Feedback tool (SimPad SkillReporter or SkillGuide) not included, has to be ordered separate. The Laerdal® Resusci Anne QCPR - Full Body.